I’ve already splashed out £1,400 on a Quark, but I plan to leave this on my time trial bike. Once you get used to riding power, you want to see what you do on your other bikes. Even though I only used it for four weeks, I would like to have power meter on road bike to measure hill climb interval efforts. The problem is that I often change from road bike to TT bike almost every day. If I was a pure time triallist one pm may be enough. But, I’m not. Stages seems the obvious choice for a second power meter. Only £700 or £800 so it’s pretty enticing because it doesn’t blow the budget completely. Unfortunately, there does seem to be a significant downside. Apparantely, quite a few users have reported the battery unit is flimsy and has a habit of letting in water. Quite a few users have already reported that their power meter stopped working – often after a heavy downpour. Well, there’s no escaping water when cycling in England. This is a bit frustrating to hear because it seems a fixable problem and just a teething problem of the first year’s model. Surely they must be able to fix this in the next upgrade. If you can develop a power meter, you would have thought you could make a waterproof battery case. They say there is a good principle to stick to when buying new technology – never buy the first product on the market. Always wait for the teething problems to be fixed and buy it in the second year. You may get a lower price, but you get the product without the bugs. Measures left leg power only. – Measuring both legs can be useful for detecting imbalances in leg strength. Something my Quark does (at least when I buy a new Garmin to be able to display l/r leg strength. From what I can gather, this gives a difficult dilemma. I will be impatient to get a power meter when I start riding my road bike. But, it makes sense to wait and hope any teething problems are fixed. Perhaps if I wait, I will get a better idea of there reliability. There is always a limitation in reviewing products from just one or two persons experience. By and large I haven’t heard of other people having problems with Quark like I have had. I may have just been unlucky. Beeline say they have sold many Quark and they haven’t had any returned. But, when you make several trips to bike shop and wait four months for replacement it does colour your experience. Stages is also difficult to come to a conclusion. Reading online reviews is always fraught with difficulties. But, it can give you a better idea than not reading any reviews. The fact that Team Sky are using Stages power meters is actually a selling point. I don’t usually buy the ‘if it’s good enough for Team Sky, it’s good enough for me‘ But, I don’t think they would take on a power meter if it wasn’t going to do the job for them. They have too much invested in the use of power meters. I guess with Team Sky they don’t have to worry about the odd power meter going wonky because of rain. They can easily just get a replacement. For the average cyclist though, it can entail a long frustrating wait when your power meter breaks. Pretty smart marketing move by Stages, if nothing else. Also, in the long term, it could mean cheaper power meters. It’s going to be hard for SRM to justify selling power meters for £2,500 when there are alternatives for £700. 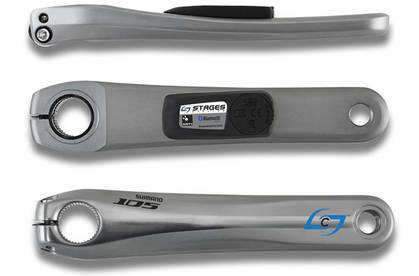 If anyone has good or bad experiences with Stages power meters do let me know. I too have had issues with my Quarq. I’ve owned it 2.5 years, and I cant remember how long it had been since I had it, I think it was after about 6 months, but it stopped working. I had to send it back to the shop I bought it, and despite them saying it would take a few days to fix, it ended up taking over three weeks, and their email correspondence left a lot to be desired. It was also coming to the end of summer, so the weather was still nice, and while I did have a spare crankset to use, I would have really liked to have been riding with power still. They ended up sending me a completely new unit by the way, as opposed to “fixing” the existing one. Around a year ago it started doing something peculiar, I’m not sure if it was related to an update to my Garmin software as it hadn’t ever happened before and a firmware update had recently been installed when I first noticed it, but it started draining batteries incredibly fast, to the point that I now take the battery out at the end of every ride, and re-install it when I am getting my bike ready. I didn’t want to send it back to the shop I bought it from to try and get them to fix it however because my first experience with them was so bad. However, despite the battery drain issue, it’s been working perfectly ever since the unit was replaced, so I can’t really complain. It’s a small annoyance to have to take the battery out after every ride, but it’s become part of my routine now so I don’t really care. If I was to buy a new bike I would love to put a Quarq on it again, but if I could only afford a Stages then I wouldn’t hesitate to buy one. Interesting article Tejvan, I don’t think a power meter would be much help to me, I haven’t even used a heart rate monitor over the last few months. However, a couple of points, why the difference in price for various cranks, when the unit itself appears to be the same. The battery unit appears to be similar to the one I have on my Garmin Sender Unit and that doesn’t let in water, plus I think that a smear of Vaseline Petroleum Jelly when putting the battery cap back on will do the trick. Having looked at Stages web site I see that you get the actual crank arm as opposed to just the unit, so that explains the cost difference, but the battery unit could be sealed with Vaseline. I was excited by Stages because of the price and the ability to simply swap it between bikes. After waiting patiently for them to come into stock, I picked on up in December. It worked perfectly for the first week, and then after the first very wet ride the battery died. After that, the battery sometimes lasted a few days, but often only 24 hours. Something was causing the battery to short out, as the dead batteries were completely discharged down to a few tenths of a volt. I put tissue paper into the battery compartment to test for leaks, but it came out dry every time. I tried the latest firmware and an “upgraded” battery cover, but it made no difference, so it went back on Monday for a refund. In use, the meter got the job done, and I was happy with the numbers and consistency, but having to change the battery every day wasn’t something I was going to put up with. I’ll wait a few months now to see if the newer batch that has arrived in the UK are better, and then consider getting another, as the other power meter options out there don’t quite meet my requirements. thanks for feedback, it looks a bit of a schoolboy error to have such as problem. Let’s hope they fix. I have been buying these power meters for a while now and so far I have had 2 out of ten develope problems. One of the power meters registered no power at all but stages replaced it immediately with no quals over the problem the second developed the same problem that Sam above encountered. I had read about this happening to other people online and so when I got chatting to the help line at stages they told me what the problem is or more importantly was. The bonding (or glue) on the back of the meter failed for a few batches (this can happen if a batch of industrial glue sits on a shelf for two long in much the same was as food or paint adhesives have a shelf life). The type of adhesive stages was using has since been changed as of mid 2013 and the problems have since stoppped. The way you can tell whether the power meter you have bought or are thinking of buying is by checking under the battery there will be a long number. It will usually look something like 0041717003.
month day year power meter produced that day. You can still purchase one of the batch that may be affected as there is know really way of telling untill you start riding hard. Tejvan if you like I currently have one shimano 6700 ultegra in stock 175mm which you can test/review or alternatively I will have two more of the same type in 172.5mm in stock by the middle of next week? I bought my Stages crank 4 months ago after months of research and reading, long before the Sky band wagon, paid £594 for the grey Ultegra model from a local supplier. Still on the 1st battery and to date I can not fault it, I will however be checking the number above in the morning when my peepers work better in natural light (age im afraid), I will hold up my hand and admit its never been ridden in wet/sodden conditions, only damp roads. Ridden alongside a mate on the same rides doing similar efforts (and yes I know its not a scientific comparison) who has a £2500 SRM and the figures are remarkably close !!! I can sympathise re Quarq – I’ve got 2 and both went wrong within 2 weeks of each other (1 for the 2nd time)! But since then I’ve had 18 months of flawless working. The spiders were replaced by UK distributor cyclepowermeters but they were not fully re-calibrated (surely a gap in their service?!) and it was obvious both were reporting different figures (off by about 10W). I ended up having to do a re-calibration using the Qalvin app and a reference weight – at least they both now agree fully. I mention this as could be an issue when using Stages and Quarq on different bikes. The gap may not be large but a 10W difference can be a new FTP high or a bad day. Previously I had a Powertap and that was definitely ~15W higher than Quarq. I bought an ultegra 6700 stages. Worked well until it rained. Stages repaired it. Worked well again, until it rained. Stages sent me a brand new replacement but it never worked. Faulty strain guage. My latest stages stopped communicating with garmin 510 after 20 mins. 5 months, 3 cranks and a repair. Still no reliable power data fron stages. Spend the extra cash get something tried and tested. My stagespower (December 2013 purchase) failed 2 weeks ago, it was draining a battery overnight after the firmware 2.0.38. This was replaced inside a week by the distributor, known issue. I had never lost a battery cover, or suspected water intrusion. Serial 11/06/13 unit 09 produced. I am sort of wondering about the durability of these units. Another brand new unit, 1 week old, appears to have failed while a firmware update was being done. Now displays very low power after the update and does not appear to be allowing further updates to be performed. Still waiting to see the outcome of this one. I have the exact same experience. Bought a stages powermeter which stopped after 2 months. I contacted the distributor and got a brand new unit. This time it worked for 1 ride The Maratona del Dolomiti which ended very wet in 2014. The battery compartment cover is very flimsy and a downright failure. I wouldn’t advise the stages to anybody until proven otherwise.